1 Anti Aging Supplement – Which Supplements are Best? 3 Anti – Aging Supplements To Secure Your Youthful Skin! Anti Aging Supplement – Which Supplements are Best? You should know by now that there is no medicine that will turn back, or stop, the clock. However, anti aging supplements is a different story. Some of these supplements may actually have some validity to them. Though their effects may not be very strong, however a little is better than nothing. Supplements that currently exist on the market include treatments for memory loss, hormonal imbalance, and protections against age-related diseases such as high cholesterol which can lead to heart disease, hypertension, arthrosclerosis, and many more. The catch with anti aging supplements is finding one that suits you and knowing it will work. The latter will never be known until you actually start taking the supplement. There are over 50 nutrients on the market, so seeking out the right mix can be daunting and confusing. There is also price to consider; you do not want to keep buying and buying, only to find out that nothing you take is working. The only way to find out what may be best for you is to understand what your body needs and which nutrients may be able to help it. You can always ask your doctor for recommendations or just to find out what he thinks. He may not think you require any supplements at all. However, if you still want to look into anti aging supplements even if he or she believes them to be unnecessary, as long as you know where the weaker spots in your body are, you can begin your search. Places to look include chain stores such as GNC, mass merchandisers like Wal-Mart, or even a local health food store if you have one nearby. All these places will carry various anti aging supplements, but depending upon your needs, you may find one better than the other. For example, GNC tends to carry a broad spectrum of nutrients that are essentially vitamins and minerals that almost anyone can take. Their focus is not on the older population, so finding a specific, powerful anti aging supplement can be difficult. The quality of the supplement you are considering may be higher priced than another. Brand names might ask for more money than a generic one. Wal-Mart is likely to have a large selection, many of which should be low priced. However, whichever store you choose and whatever supplement you are looking for, avoid chatting too much with a salesperson, as they may try to get you to buy something that is more costly, either doesn’t do exactly what you want or on clearance. Be wary of clearance items; clearance prices mean that the product is not selling well or it is nearing its expiration date. Always read the label before you purchase the item so you know what it is supposed to do and what the ingredients are. Sometimes it may contain a derivative of a vitamin as opposed to the vitamin itself. Take it as it says on the bottle and hopefully the anti aging supplement you choose will give your body a boost just like you wanted. The fear of aging is very common among people reaching their 30s. This is when you wait for other people to say you look younger than your age that makes your life complete. Admit it or not, whether you are a man or a woman, whatever your stature in life is, you want to look young and feel young without worrying about the free radical damage. However, you cannot stop aging, no matter what you do. The best thing you can do is to slow down the process. 1. Do you personally know someone who has used this product? 2. Is the price worth its benefits? Read the label. 3. Did you ask your doctor about taking this treatment? It’s important to ask your doctor about these matters most especially if it’s taken orally. 4. Are you sure you need it? Sometimes though you don’t need something; it’s just the urge of following the trend that makes you use them. So make sure you need it. 5. Is it the genuine? There are a lot of fake anti-aging supplements available everywhere, so be careful. This is an oxidant that protects your body from the harmful effects of free radicals. Vitamin E enhances the functioning of the immune system and assists in the expression of genes. Vitamin C intake enhances the firmness of your skin and improves collagen production, which gives your skin a youthful appearance. Collagen tissue is also vital for healing wounds. Not only is vitamin C an antioxidant, it helps to regenerate other antioxidants in the body, including vitamin E.
Vitamin K has been shown to help older people maintain bone strength. This vitamin also helps in preventing getting dark eye circles. This vitamin increases moisture in your skin that makes you look younger and healthier. It raises your “good” cholesterol (high-density lipoproteins, or HDL) and also lowers triglycerides, which are the fats in your blood that contribute to your overall cholesterol count. This vitamin helps offset the effects of osteoporosis as you get older. It also reduces the signs of sun damage and aging by exfoliating the skin and lessening wrinkles and fine lines. Not all the benefits of each vitamin were included; these are just the major benefits that you can get from them. To check the complete lists of benefits you may browse the Net or ask your doctor about them. These vitamins might not totally stop the aging process but taking the right amount of each can help you get a younger appearance. Of course, these supplements will not work properly without proper diet and exercise. It is wise to keep yourself on the go at all times to make your body feel lighter and more vibrant. Always remember to take care of yourself to be able to take care of the people around you. Also, there is no such thing as too late. Anti – Aging Supplements To Secure Your Youthful Skin! Who would not want to have a youthful skin? There is a general scenario in the present society where aging is seen as a threat and we all tend to join the bandwagon of wanting to have youthful skin. This brings us to have the awareness for the anti-aging products that are made for slowing down of aging. Not all, but selective of these anti-aging supplement and products are quite effective for slow aging or at least, it can make you look younger and healthy. And to stay healthy and young, we need supplement or body with the sufficient amount of nutrients and antioxidant that will help to slow down the aging process. As we grow old, our body produces less of what it requires to be young and healthy and therefore our skin starts to show the signs of aging. By supplementing it with the vitamins and antioxidants, we can help the body to delay aging and look young for longer period of time. 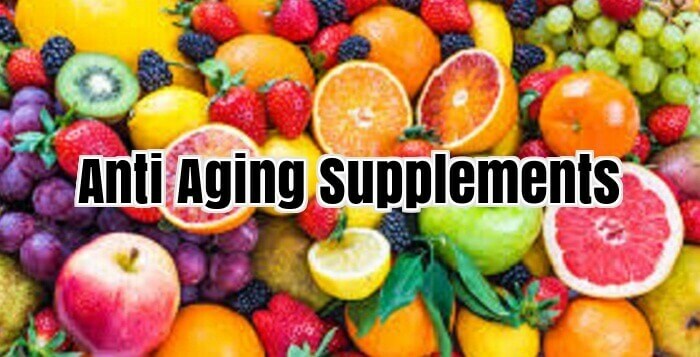 Antioxidant in health supplement plays a major role in slowing down the process of aging. Antioxidants work by neutralizing highly destructive and reactive compounds called free radicals. Antioxidant fights these free radicals and transfers them into waste. So antioxidants help us to remain healthy by removing unnecessary cells from our body. One can get anti-aging antioxidants from several healthy foods such as fruits and vegetables. And if by some reasons, you don’t get the necessary antioxidants from such diet, and then you can consult your doctor for antioxidant supplements. Besides taking regular antioxidant, there are several other anti-aging supplements that can be taken for the delay in the aging process. The most prominent among various anti-aging supplements are Vitamin E, Vitamin C and Green tea. Vitamin E is widely taken as an anti-aging supplement and it is available in the form of pills or capsule. It is also a key ingredient in many anti-aging lotions and creams. As an antioxidant, Vitamin E helps to fight radicals. It also acts as a moisturizer and tightens your skin. Vitamin C is another important antioxidant and anti-aging supplement. Apart from fighting for radicals, it helps your skin keep rejuvenated. Like these vitamins C and E, green tea is also very effective in combating free radicals. As we age, we are all trying to hold back the hands of time and the marks it leaves on our bodies and most in particular, our faces, the windows that represent us to the world. There are many methods of attack when it comes to the fight against the inevitable. Make-up, surgery, drugs, and exercise are all possible avenues in the pursuit of feeling and looking eternally young. However, there are other options that are more inviting and simpler to achieve beneficial results. A host of anti aging nutritional supplements can be found on the market or in the garden if one does the research, asks questions, and takes the time to look. It is much more preferable to choose a natural path that will improve the body’s health, appearance, and make a person feel better as well with the benefits contained in nutritional supplements. Food and diet is an excellent place to start in the war against aging. Anything that contains antioxidants, known to attack radicals in the body and thereby avoiding damage to cells, will be helpful in maintaining youth. Many teas, including green tea and black tea, are a good source of antioxidants. Each time someone drinks a cup to start the day or relax, repair work can be taking place in the body. Fish provides omega-3 fatty acids, good for the heart and striving for overall health as well. Poultry is another valuable source of antioxidants. When it comes to fruits and vegetables, the more colourful the better and a variety should be consumed each day with at least five helpings as a general rule of thumb. Berries and citrus fruits are first rate sources that include valuable vitamins as well; select leafy greens, such as spinach, kale, and broccolis are good picks for vegetables. Legumes provide the same benefits as fruits and vegetables and should be eaten several times in the course of a week. Nuts are an excellent source of vitamins that will sustain the body’s youth. Yogurt is another good option in the fight against aging as the bacteria in the dairy product improves intestinal health. For that youthful appearance, every part of the body should be at optimum performance. Water is another essential; practically an elixir of life as it controls the body’s temperature, carries nutrients and oxygen to the cells, protects the organs and promotes overall health of all body functions. In the battle to slow the effects of passing years on the human body, herbal supplements are another alternative. Vitamins of choice include vitamin C for the immune system and healthy skin and bones, vitamin E for heart health and prevention of cancer, and selenium for healthy nails and hair. Additional supplements are available that contain the acai berry for its antioxidant properties. Resveratrol is a supplement intended to boost heart health and for the nervous system. Grape seed extract is another powerful antioxidant. There are many benefits of anti aging supplement. Some of these benefits include smallest amount or no side effects, but are effortless to find and make use of. These products comprise of natural supplements abundant in anti oxidants. Immunity, being the most vital, should never be taken for granted. Over a period of time, aging reduces your immunity levels, making you prone to diseases and infections. But your anti aging supplement forestalls that with its immunity boosters. It reinforces your immune system and guarantees that you do not fall sick. Your anti-aging-supplements are now also helpful in ensuring strong resistance levels, thereby slowing down the process of aging. Your anti aging supplement can also provide you with stamina needed for your daily exercise regimen. Yes, exercise is important to look good and feel good. Anti-aging supplements give you the energy you need to sweat your way towards slowing down your aging! Also, include fresh vegetable and fruits in your diet which are rich with anti oxidant properties, herbal extracts like green tea and Vitamins A and E.
As surprised as you may be, but your anti aging supplement enhances your memory. It fortifies your mind and helps your brain to function in a controlled state. The herbal extracts in your anti aging supplements are the main reason behind your even bodily and psychological functionality. Since your supplement is comprised of many vital herbal and medical extracts, it’s a good source of fulfilling your multi vitamin needs. It also fulfils the loss of valuable nutritional content, vitamins and important acids, fats and carbohydrates. Multi vitamins make up for the imbalance caused in your body due to a unhealthy diet. If we are having quality, we are not having it in the right quantity. If we are having quantity, it is poor quality; a hamburger at the local McDonalds joint or a plate of French fries. The foods we eat make us some of the most poorly fed people in the world, with a lot in quality but no quality to boast of. It improves your skin, making it smooth and blemish and wrinkle free. You’ll have your actual age off your face, making you look young and radiant. The people would definitely double take on you, wondering how you knocked off all those years off your face. And this appreciation from the world would make you feel much more confident and happy. And being happy is also one of the best ways to look young! Anti-Aging-supplements are apparently a wise choice to make up for the loss of nutritional value. It improves your energy levels, making you agile. Restore your skin, making you look young and radiant. Anti aging supplements provides with more immunity. Take your anti-aging-supplements daily, and stay young forever. Anti aging health supplements is the best way to go, when it arrives to fighting the indications of getting older that begins to show up as you age. Aging is everlasting, but as you age the desire to look younger and lovely grows manifold. Individuals consider out various products, supplements and diet programs in purchase to bring back their youthful looks. As a result anti aging goods and dietary supplements holds a even bigger marketplace these times, simply because people are inclined to shell out any value to carry back again the spirit of youth. Even so, in buy to get optimum final results out of your health supplements for anti ageing, realizing what they are and how they perform, is truly important. How anti growing older dietary supplements function? Prior to you consider to find out how anti aging health supplements operate, you require realizing two issues. 1st, getting older is unavoidable there is no magic solution to stop it. Nevertheless what you can do is to postpone its outcomes and appear youthful for an extended period of time of time. The 2nd most essential factor that you need to fully grasp is how you age and try to reverse its consequences, even though it is not as basic as it may possibly seem to be. Your biological processes can be your greatest buddies, but at the identical time they are your enemies as properly, since they also harm your physique in because of class of time. One of the largest reasons for growing older is cost-free radicals, which mainly causes damage to the wholesome cells in our human body and speeds up the ageing procedure. So as you age, your human body fails to repair the damages naturally and this is in which anti getting older supplements come into performing. These nutritional supplements mostly include vitamins, enzymes and antioxidants that aid repair service the ruined cells, nourish your physique and combat the totally free radicals at the same time. Therefore assist slowing down the growing older method and make you truly feel young and rejuvenated. When it will come to products and nutritional supplements, there is no shortage of them in the industry and most of them claim to give you everlasting youth. Even so, you need to not fall prey to any hoopla or feel any promises that audio also great to be correct and really should take optimum care when investing in your anti getting older products. It really is not only your money that is at stake, some of the anti aging products and dietary supplements also may cause aspect effects. This is why there are specific issues to seem for in your anti aging goods and right here they are: – Do not decide for products that have chemical agents. This is mainly applicable when it comes to anti aging health supplements for your skin. Always try out to go for normal products that include adequate quantity of Vitamin Do and Vitamin E as they are the best dietary supplements when it will come to rejuvenating your pores and skin. Decide on your items based mostly on your particular pores and skin type and avoid therapies that use chemical substances as it could give you aspect outcomes like skin rashes or skin burns. – Consider to acquire maximum information about the ingredients that goes into the dietary supplements and how effective they are in slowing down the ageing method. So just before you buy your supplement verify out its listing of components very first and then make up your thoughts. – Before you choose for any specific merchandise try out to uncover out what individuals are declaring about the products. This simply means that looking for reviews and posts about the products and its performance in combating aging. World Wide Web can be your finest guidebook for this. If you place a little energy and conducts complete study then you can absolutely stop up locating the very best solution for you. Nonetheless, you should bear in mind that your nutritional supplements will only perform at its greatest when you mix it with appropriate diet and a wholesome lifestyle. Anti Ageing Nutritional vitamins are genuinely critical when it happens to fighting the getting older method. They are an easy resource of vitamins, minerals and anti-oxidants that assist avoid cell injury and revitalize the physique by boosting metabolism and mobile growth. If you can only afford to take one anti aging supplement daily, you might want to consider taking fish oil supplements. Anti aging fish oil supplements are widely available in a gel tab form that looks a lot like Vitamin E tablets, except the liquid substance inside is actual fish oil instead of vitamins. Fish oil has been shown to have a number of scientifically verified effects on the human body that both slow the aging process and help to prevent common chronic diseases that are more frequent in later years. Perhaps the most stunning effect of anti-aging fish oil supplements is the way it reduces inflammation within the human body. A recent study published in the January 2010 issue of Critical Care concluded that fish oil supplements were more effective than soybean oil supplements in reducing inflammation in 23 patients hospitalized after surgery and placed in intensive care due to increased risk of infection. Intravenous fish oil given to these patients resulted in shorter intensive care stays and lower rates of infection that were statistically significant. Fish oil supplements have the same anti-aging and anti-inflammatory properties when taken on a daily basis as part of a normal diet, thereby helping to prevent a wide variety of inflammatory illnesses such as arthritis, autoimmune diseases, heart disease, stroke, and even dementia and Alzheimer’s. Another scientific team, this time at the University of California at San Francisco, recently published findings in the Journal of the American Medical Association that show that fish oil supplements appear to actually prevent DNA from degrading: something that was previously thought to be unpreventable with age. By keeping DNA chains intact and the information they store well-organized, fish oil supplements directly impact the aging process by slowing it down. The magic anti-aging elixirs found in fish oil supplements are Omega-3 fatty acids, substances that modern diets tend to lack because of the enormous amount of fat, sugar, salt, and corn that has only very recently been added to them. In other cultures, where fatty fish like salmon, mackerel, cod, and halibut are eaten daily or at least three or four times each week, people naturally live longer and are less likely to come down with chronic inflammatory illness like heart disease. Another factor contributing to the decline in available Omega-3 fatty acids in the modern diet is the advent of corn fed meat. Before industrial meat production took hold after 1950, most chicken, beef, and pork was fed on mostly grass and green vegetable matter (such as table scraps). Wild grasses and the grains they produce have much higher concentrations of Omega-3 fatty acids than corn, which lacks this essential nutrient. Corn produces meat much faster and cheaper when fed to livestock than grass feeding, but some farmers are now returning to older grass-fed methods because of the higher nutritional value in the meat and the more humane treatment of the animals. Grass fed meat is high in Omega-3 fatty acids but tends to be expensive. To get the maximum benefit from dietary changes, ‘shop the edges of the store’. In other words, buy foods that are mostly in their natural state or close to it, such as lean meat, fresh fish, fresh produce, and whole grains. Do that, take your fish oil supplements every day, and chances are you’ll feel better and look better for years to come. Over the past few years, there has been a sharp spotlight shining down on the anti-aging industry and what is available to us that might be considered the holy grail of longevity. Let’s face it, we all want to live long lives and feast on all life has to offer, but on top of that, we want to live long, healthy, and active lives. Aging may be inevitable, but the rate at which we age is not. There has been an astounding amount of investigation into the aging process, examining what transpires from a cellular level within our bodies. Knowing how and why your body changes with age aids with research in finding and examining the anti-aging supplements on the market that impedes alterations in cell, tissue, and organ function that slow you down. This article will be a manual to inform you on the 7 very best available today. Resveratrol – This substance has been the subject of some of the most amazing anti-aging research. It is looked at as the crucial worthy molecule in red wine and is considered a prominent part of the healthy Mediterranean diet. Resveratrol’s abilities have been revealed to enforce the health of a wide range of body tissues, organs and systems, including the cardiovascular and nervous systems. Green Tea Extract – EGCG (Epigallocatechin Gallate), one of the most powerful organically occurring antioxidants, which has been scientifically linked to the traditional benefits of green tea, continues to be the focus of some of the most exciting anti-aging research with regards to the heart, brain and other vital organs. Gamma Vitamin E – Significant type of vitamin E found in nature – gamma tocopherol. All four types of Vitamin E can be found in what we eat, but only in foods that we eat very little of, like foods or oils high in fat. Most Vitamin E supplements only provide alpha tocopherol, which doesn’t rank as high as gamma. Most vitamin E benefits are experienced, seen with the Gamma form. Exploration continues on Gamma Vitamin’s E role is the decrease of breast cancer, prostate cancer, and colon cancer. Gamma Vitamin E is a potent destroyer of free radicals in the body, consequently making it a fantastic anti-aging supplement. Alpha Lipoic Acid – ALA has the rare capability to exist in either water or oil-based environments, which enables ALA to deliver its potent antioxidant benefits virtually anywhere in the body. ALA is routinely referred to as the “universal antioxidant” because of this capacity to reside anywhere in the body. As an anti-aging supplement, this ranks extremely high. CoQ10 – For all cellular energy to be produced CoQ10 must be present, otherwise we wouldn’t be able to operate at high levels. All cells require CoQ10 to produce energy and provide potent antioxidant defence. CoQ10 is found in the highest concentrations in the hardest working organs in the body, such as the heart, brain, liver and kidneys. The ability of these organs to deliver energy and shield themselves from free radicals defines what superior health and anti-aging supplementation is all about. Omega- 3 Fatty Acids – The Omega-3 oils comprise billions of cell membranes in our body and given that they cannot be produced by the body, their health benefits are only presented by eating a diet rich in fish, or with an Omega-3 supplement. Research has shown that diets loaded in Omega-3 fats are related with exceptional heart, brain and circulatory health. Sadly, the typical American diet supplies little of the Omega-3’s essential or suggested for good health which makes it a prime anti-aging supplement to use. Grape Seed Extract – Grape seed extract is another robust anti-aging supplement. It strengthens and supports living tissue and aids in circulation. It is a super antioxidant, 20-50 times more potent than vitamin C, E and beta-carotene. As we age, our bodies make less antioxidant to fight the aging process.